Tryouts - April 16 and 23 from 5-7 p.m. The Emerald Youth Breakfast will include music by the Emerald Youth choir, a message from Emerald's President & CEO Steve Diggs and much more. The event is complimentary, and an offering will be taken in support of Emerald Youth's ministry with city kids. Online registration has concluded. If you would like to attend, please call our main office at 865-637-3227 ext. 132. Info Meeting - March 12 @ 6pm. Season will run from February 11th – May 10th, 2019. Make-up tryouts are Friday, Nov. 30! Tryouts are Saturday, Nov. 17! Help us stock our Christmas Store! Your purchase of a new gift or financial contribution will help "stock the store" this Christmas! Stop by Knoxville-area Pilot locations between now and August 31st to round up your change for Emerald! Help Emerald win $25,000! Vote daily for our video in the #25yearsofgiving contest by First Tennessee Foundation. Our friends at The Law Offices of G. Turner Howard III are "Painting Knox Emerald". See how they are supporting us and how you can too! We are asking our Emerald family to donate online or purchase Christmas toys through our Walmart and Amazon Wish Lists for youth living in our city. All donations and toys purchased will be used to supply our Christmas Store in December. The Emerald Youth Christmas Store expects to serve more than 400 city children and their families this upcoming holiday season. The store gives parents of children in our ministry the opportunity to purchase gifts at a deeply discounted rate. Don’t miss your chance to celebrate this July. Come learn more about full and part time opportunities available in our work across the city. The Emerald Force men's team will host the New Orleans Jesters in a National Premier Soccer League home match at Sansom Sports Complex on June 6. The Emerald Force women's team take on Nashville Rhythm at Sansom Sports Complex in a Women's Premier Soccer League match. The Emerald Force men's team will take on I-75 rivals Chattanooga FC in a mid-week National Premier Soccer League match. The Emerald Force men's team will take on Inter Nashville in a National Premier Soccer League match home match at Sansom Sports Complex. Deadline for the Emerald Force swim team is May 15. Register your child now! Emerald Youth is thrilled to host the TeamFirst Soccer Academy this spring at Sansom Sports Complex May 5 - 6. Register Now! The Knoxville Ice Bears are supporting Emerald Youth Foundation on March 31st. You will not want to miss this exciting game and a chance to help our ministry with city kids! Make sure you purchase tickets through our link; as well as, pass it on to your family and friends. As part of AmeriCorps Week 2018, Emerald Youth is highlighting the service of some past and present AmeriCorps members. 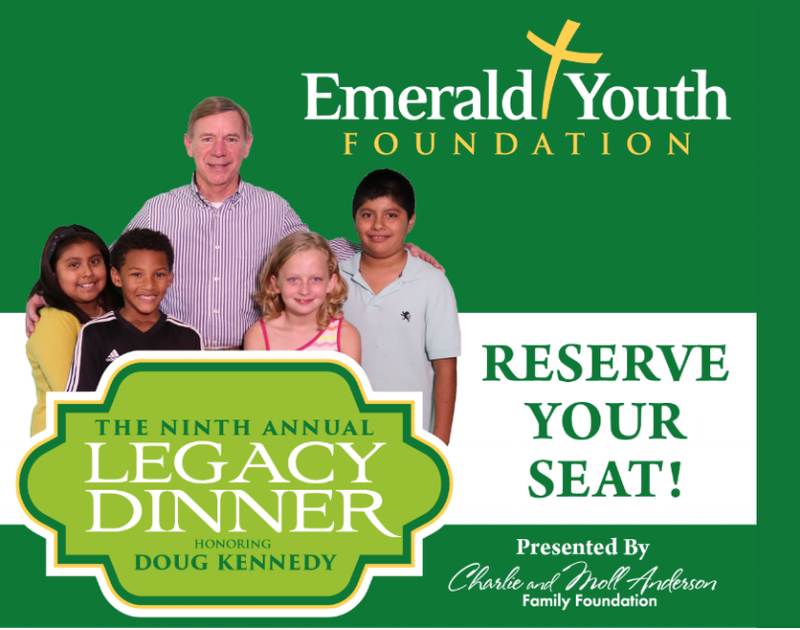 RESERVE YOUR SEAT FOR THE 9TH ANNUAL EMERALD YOUTH FOUNDATION LEGACY DINNER. This year's Legacy Dinner will honor local businessman Doug Kennedy. A reception begins at 6:00 pm, with dinner and program at 6:30 pm. Host a table or reserve your seat today!